An 11″ x 14″ acrylic painting on gallery wrapped canvas by Diana Mae Potts; copyright 2013. Sold on eBay July 27, 2013 and now has a happy home in Michigan. I grew up on a farm in central New Jersey where there were pheasants. For awhile we had a pair of golden pheasants. Their splendid plumage was something I never forgot and so in later years I sought out to do studies of them. I now can portray them from memory which is how I did this one. 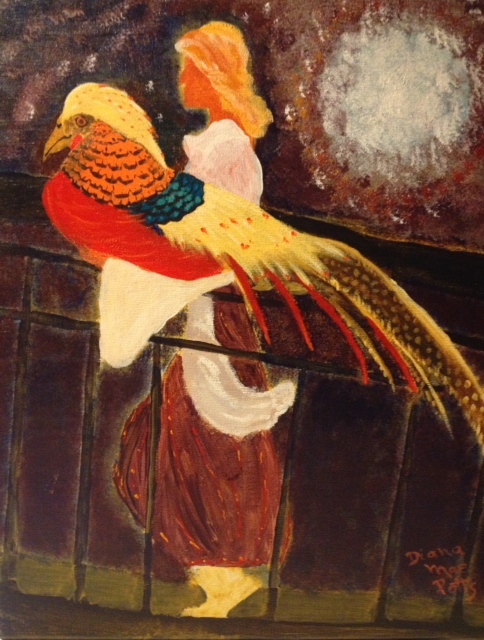 Another painting of a lady and a golden pheasant will be finished today and put on eBay. I’m inclined to agree with Regina. I mean, I’m higlhy skeptical of this new “admission” on the part of Megan Williams. While I don’t discount anything entirely any more (the world does, indeed, often seem to me to have gone utterly mad), I’m more inclined to believe there’s a reeeeally interesting backstory here. For example (and I have no idea whether this could be true or not, but…), what if the White folks pled guilty because they did what they were first accused of (let’s face it, folks, there was physical evidence, as well, after all — it wasn’t just her word against theirs). And then what if some money magically appeared to pay Megan Williams off to “admit” that she lied. She’s already demonstrated less than stellar judgment in the past in a whole raft of ways. But who knows?I was born in the mountains of Kentucky, by the way. There’s a reason I stay far, far away from there, though I now live where the Justice of the Peace wouldn’t marry the bi-racial couple. I must have some hellified karma to work out for some reason, huh? I'm inclined to agree with Regina. I mean, I'm highly skeptical of this new "admission" on the part of Megan Williams. While I don't discount anything entirely any more (the world does, indeed, often seem to me to have gone utterly mad), I'm more inclined to believe there's a reeeeally interesting backstory here. For example (and I have no idea whether this could be true or not, but…), what if the White folks pled guilty because they did what they were first accused of (let's face it, folks, there was physical evidence, as well, after all — it wasn't just her word against theirs). And then what if some money magically appeared to pay Megan Williams off to "admit" that she lied. She's already demonstrated less than stellar judgment in the past in a whole raft of ways. But who knows?I was born in the mountains of Kentucky, by the way. There's a reason I stay far, far away from there, though I now live where the Justice of the Peace wouldn't marry the bi-racial couple. I must have some hellified karma to work out for some reason, huh?